The last property has been purchased with 2013’s £10m Social Investment Bond to fund permanent homes for people with a learning disability. 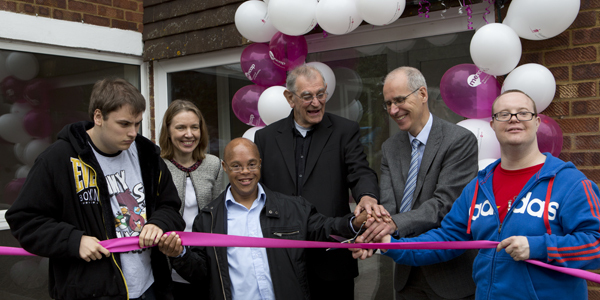 On 30 May 2014 Golden Lane Housing (GLH), Mencap’s housing service, welcomed guests to celebrate the four tenants moving into the final property bought from the £10m charity bond. GLH have now bought 27 properties providing independent living opportunities for 99 people with a learning disability. Only 16% of people with a learning disability live in supported housing in the community and Mencap research has found 8 in 10 councils report a housing shortage for adults with a learning disability. This bond issue was the first step in raising up to £30 million pounds over the next few years, which will in total allow investors to give 250 people with a learning disability the chance to live independently and take control of their own lives. The new tenants with a learning disability moved in to their brand new five-bed property on Monday 2 June 2014. The property will have room for five tenants and one sleep-in support worker, with all rooms being provided with en-suite bathrooms. Buckinghamshire County Council provided support with the design of the accommodation, and it has entered into a nomination agreement to ensure that the service is fully occupied. James, Bryan, Danny and Ryan are the four tenants with learning disability who have moved into the final new property in Buckinghamshire on Monday 2 June 2014. They previously lived in a Mencap residential care home at Lee Road but are now excited to have moved into their new property. GLH, which is the housing arm of the charity Mencap, are assessing the impact of the bond on people who move using Mencap’s “What Matters to Me” framework. This is enabling them to assess and report on the difference the move has made to people in terms of their quality of life and independence. Be the first to comment on "Golden Lane Housing celebrate final property purchased for people with a learning disability from £10 million charity bond"